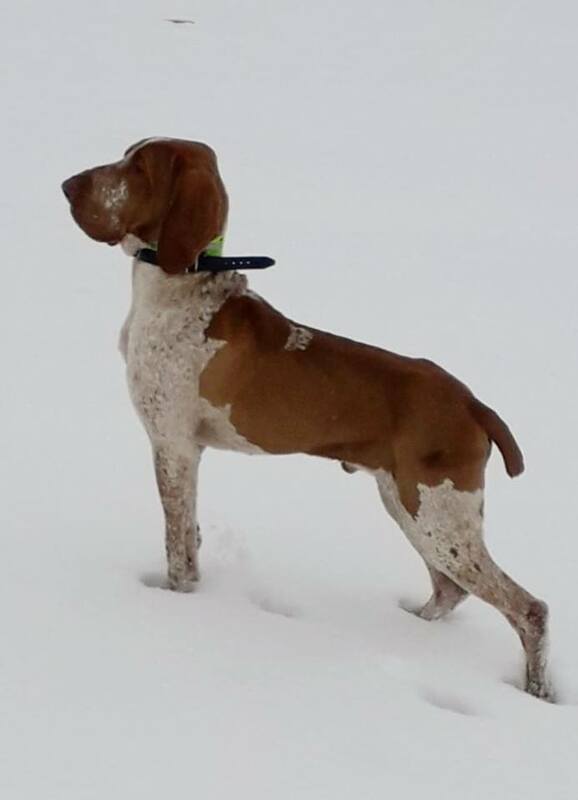 Our kennel's goal is to breed great looking and well working (hunting)Bracco Italianos . All our dogs have gone through skill tests and are screened for hip dysplasia. Although we place an importance on their ability to be great hunters – dogs from our kennel don't need to be kept as hunting dogs – you can own a perfectly happy Bracco even if you “just” take them for walks or play sports with them. They can be kept indoors, outdoors or in a kennel but the closeness of their master is what's most important to them. Our dogs are kept in kennels with a long stretch of running area. From time to time we have a “favoured” dog who spends time in the house while she is in heat or if she is pregnant. In addition to excercising them regularly with walks, biking and swimming - in hunting season we also join huntsmen in search and fetch missions. We make a special effort to choose puppies for our future customers based on the personality and looks of the puppies. It's very important for us that these dogs find good homes and that the new owners are happy with their new puppies. We can provide you with information over the phone but buying a dog requires an in-person meeting. 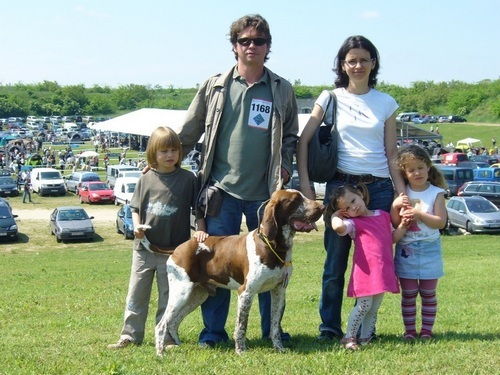 We have a great relationship with the most of the Bonfini- customers abroad and in Hungary and appreciate all feedback on the dogs, their awards or any other Bracco-related topic. 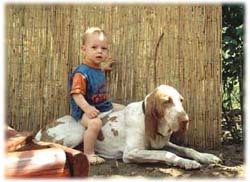 The Bracco Italiano - except a rambunctious few - is a great family dog. It has all the qualities the pointers are famous for: its love of children, loyalty, calm personality, love of the comfort of a home and great relationship with all members of the family. Just like with the training of a hunting dog, it's crucial to be consistent and patient with them. A few of them make great guard dogs, although on neutral territory they don't show any aggression towards humans or their own kind. Outside Italy the significance of the Bracco as a hunting dog is small. Although it's considered the ancestor of many European pointers, its work style is very different. It has a great ability to work as a hunting dog (field, water and forest) but what makes it interesting is its work in fields. The gait in the field is not the gallop but a trot while searching the wild and on the scent. Equipped with a great nose, persistence and meticulousness the Bracco doesn't tire or lose speed after a long day of hunting. He is also adept at sensing flocks, and works eagerly in difficult terrain. Since they have a high tolerance for pain they don't spare any effort to get the job done. 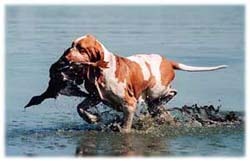 Like with every hunting dog, great emphasis has to be put on obedience. Our Bracchi work equally well in water too: they've proven it many times over when pursuing a fallen duck or fetching a bleeding bird from the middle of a lake. I could write page after page about the Bracco as a hunting dog but if you're further interested you can find more information on our home page in the Pastrone-Standard. Bracco Italiano represents the seventh group along with setters and other kind of pointers and the Breton spaniel. Since this is a very rare breed - even in Italy - you will only encounter a few at dog shows. 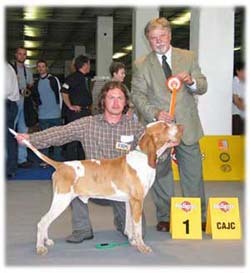 More examples can be seen on specialized Bracco-meetings (Raduno, Monstre Speziale) and also at the European and World Dog Shows. Since Italy is fairly large in size, there are many varieties in different regions of the country. These differences are represented in bone structure, size and in the skin of the skull but the expert eye can also spot the differences in the upper and lower line and facial expressions. Although most of the judges in Hungary have a very good understanding of the Bracco Italiano, we think it's important that our dogs get measured up in Italy too. I bought my first Bracco, Norma, with my wife in Holland. We met her breeder Karel J. Labberté in the 1996 Budapest World Dog Show, with whom we have a great relationship ever since. My wife – speaking 3 languages – keeps contacts with our foreign partners. Due to the steady growth of our breed (at present we have six Braccos), we have moved to the country, where our garden as well as the neighbouring lakes and meadows provide sufficient space for our dogs for working, hunting, swimming or walking. Being a member of the hunting dog jury of MEOE (FCI) I am often requested as a judge in examinations and trials. With our three children we live only a few kms from Tata in a little village called Naszály, which is easily accesible from anywhere: driving on M1 only 7 minutes from Exit Tata. We reply to your request in 24 hours. If there is no answer to your e-mail within this time, please contact us by phone or mail. (Because of a problem there were several e-mails that weren't received on time lately.) Thank you!